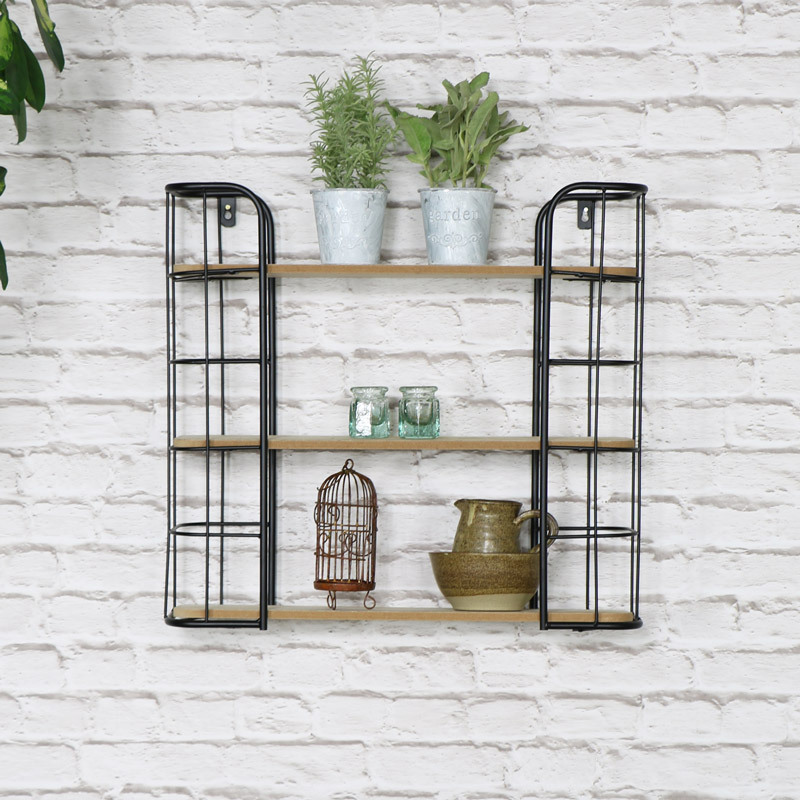 A simple but practical storage solution is what these industrial wall shelves offer. Three natural look wooden shelves showcased by a metal wire frame to give it an authentic industrial, rustic finish. This is perfect for a minimalistic home or simply if you have a smaller wall space that needs an eye catching focal point. From spices and crockery in the kitchen to lotions and potions in the bathroom, show them off in a retro / rustic style. The height of the first two shelves stands at 17cm and with the top shelf being open topped you can really take full use of the space to store or show off those homely treasures. 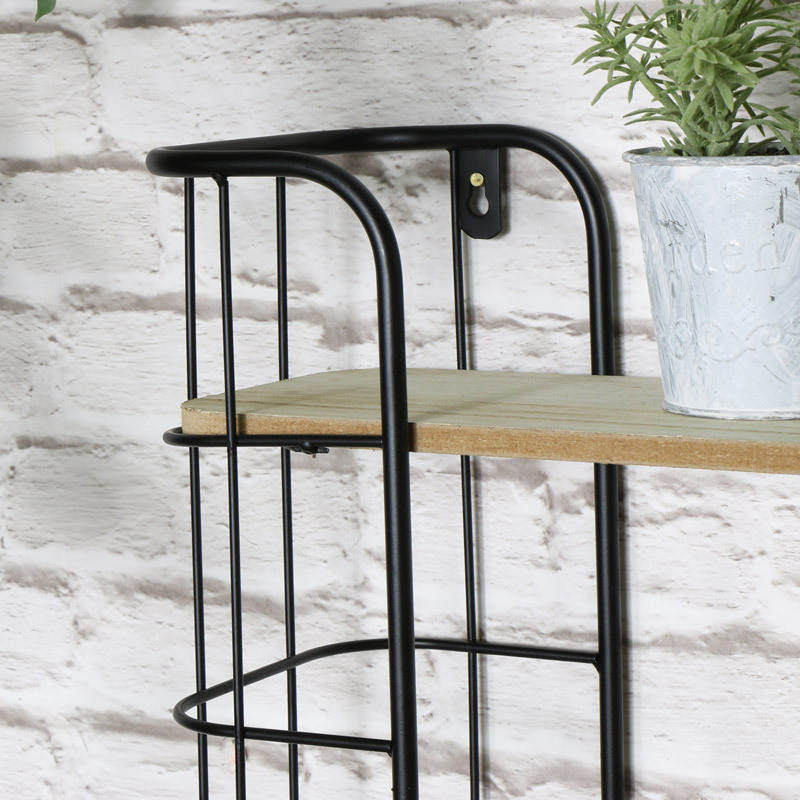 A simple but practical storage solution is what these industrial wall shelves offer. Three natural look wooden shelves showcased by a metal wire frame to give it an authentic industrial, rustic finish. This is perfect for a minimalistic home or simply if you have a smaller wall space that needs an eye catching focal point. From spices and crockery in the kitchen to lotions and potions in the bathroom, show them off in a retro / rustic style. The height of the first two shelves stands at 17cm and with the top shelf being open topped you can really take full use of the space to store or show off those homely treasures. Measurements (other): Gap between the bottom two shelves stands at 17cm high. Assembly Time: 5 minutes Side panels, shelves and screws all come separate.